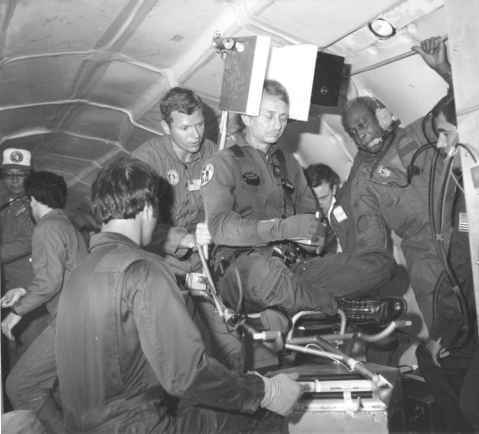 Aboard the KC-135 aircraft, Garriott participates in a simulation of a vestibular function experiment planned for Spacelab 1.
in Stuttgart, Germany. 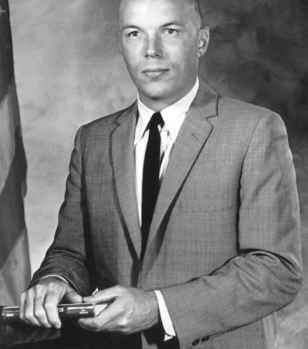 With this flight, Merbold also became the first non-American crew member aboard an American manned space mission. The six-man crew was divided into two teams, each with a pilot, mission specialist and payload specialist. On this flight the nominated "Red" team consisted of mission commander and Chief of the Astronaut Office John Young, making his sixth and final space flight, plus Bob Parker and Ulf Merbold. The "Blue" team consisted of firsttime Shuttle pilot Brewster Shaw, plus Owen Garriott and Byron Lichtenberg. They would work alternating twelve-hour shifts for the duration of the mission, with the "Red" team working from 9: 00 p.m. (EST) to 9: 00 a.m. and the "Blue" team from 9: 00 a.m. to 9: 00 p.m. All of the crew members prepared for the mission weeks in advance by adjusting their waking/eating/sleeping routine to suit the shifts they would operate on Spacelab. During the flight, they would meet twice a day at changeover time to discuss operations and share meals, but it also provided a curious scene, as one team would be eating breakfast, while the other was enjoying dinner. "For the first time in space flight,'' a bemused commander Young observed before the launch, "the doctors outnumber the pilots four to two. It's going to be a very interesting and unusual mission. ''30 Also worthy of note is the fact that the flight would mark the beginning of a strong and lasting friendship between veteran pilot Young and scientist Merbold. 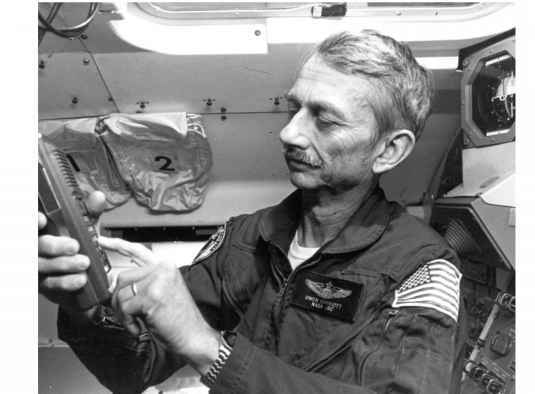 Garriott demonstrates a hand-held amateur radio transceiver of the type he used during the Spacelab 1 mission. A licensed "ham" since his teens, he conducted the first demonstration of amateur radio operation from a manned spacecraft during his off-duty hours. In August 1978, Garriott and Parker were named as mission specialists for the first Spacelab mission, although Garriott has always preferred their official title of ''scientist-astronaut'' to the more generic designation. The actual mission was then scheduled for launch in two years, allowing them plenty of time to visit Europe and follow the construction of Spacelab 1, but it would actually be more than five years before the mission finally took place. Meanwhile, in September 1982, Lichtenberg and Merbold were named as the two payload specialists assigned to the flight. The four scientists had actually begun their first flight experiments prior to the launch, and these would only conclude two weeks after landing. During both periods -terrestrial and orbital - various samples were taken, including blood, as part of an attempt to analyse and understand the way in which the human body adapts to weightlessness. Ground-based scientists would compare data from orbit with that gathered before and after the mission.